Health • Hoof Care • Nutrition"Laminitis is an emergency, just like Colic." This weekend work held a laminitis clinic and it was really interesting. There were several lectures by vets who have been researching laminitis and cushing’s disease for years, followed by demonstrations from farriers of different products and methods for a lamanitic horse. There are a few things which really stood out to me from this weekend. One of which is something one of the vets said during his lecture. He said that laminitis is as much of an emergency as colic. 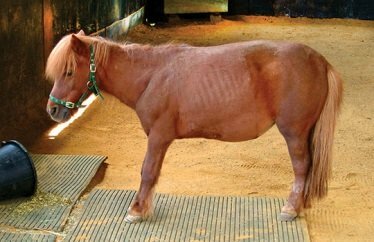 If your horse shows any signs of colic, you should contact the vet immediately. I thought this was really interesting as depending on how bad the horse was, I don’t think many people would do this. I think that is because the majority of owners know the causes of laminitis and know what to do next. Which is usually box rest, deep bed, no sugar/extra food etc. In fact I think more owners are more likely to get a farrier out first to see how sore the feet are and possibly change shoes to give the horse more support. But I could be wrong. His reason was that the earlier you act, the better outcome the horse has. Which I totally agree with. However, I personally feel that he was talking about more severe cases of laminitis and that this is not quite as relevant to slightly lamanitic pony. But it is still a very interesting idea! Another vet also made a very interesting comment. She said that she thinks physio and massage is very important to a lamanitic horse and she would recommend it. Her reason was that the typical lamanitic stance can put a lot of strain on the flexor tendons, which can cause the flexor muscles to spasm. She said that massaging the flexor muscles can help stop the spasming and can potentially help relax the tendons. In fact someone recently wrote about this on Bridle & Bone. One of the vets also said that some feed companies ‘copy’ the laminitis trusts logo to put on their feeds to trick owners into thinking that these feeds are suitable for lamanitic ponies. So if you feed these feeds, make sure they have the following logo, not a copy/similar version. Some of the product demonstrations were also really interesting, you wouldn’t believe the amount of different products available to lamanitic ponies and the farriers creating and using these sometimes specialist products really know their stuff! it was a really interesting day and I hope work holds more of these events so I can go!